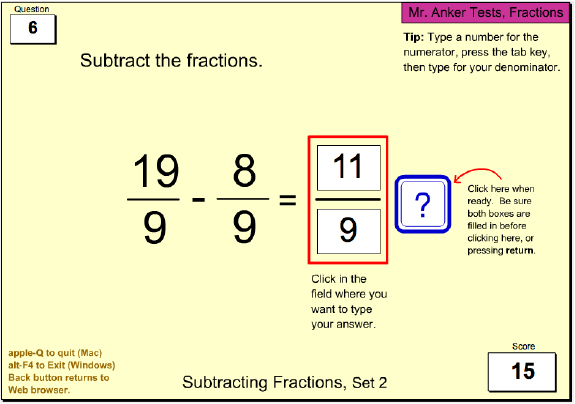 Use these practice activities to get better at working with fractions. 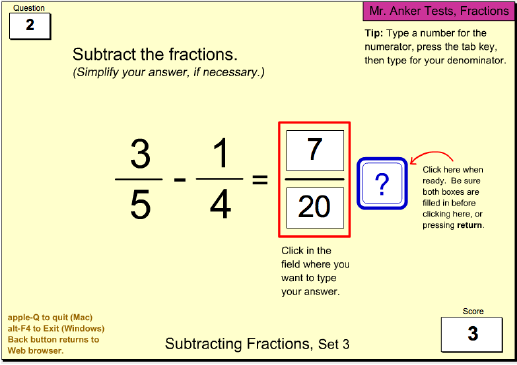 There are many sections below, including adding, subtracting, multiplying and dividing fractions. There are also sections on improper fractions and mixed numbers, along with simplifying fractions and others. 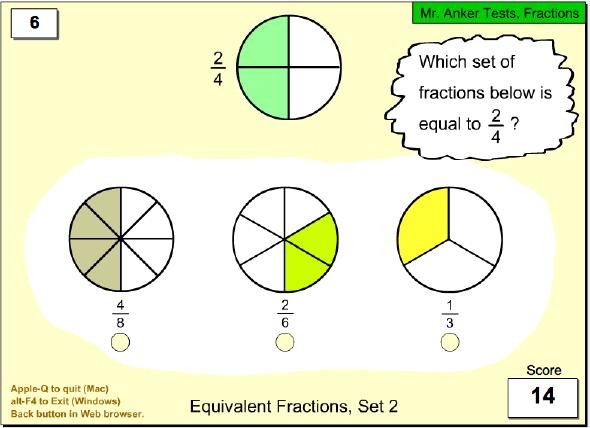 Simple fractions with clear illustrations, no simplification is used here. 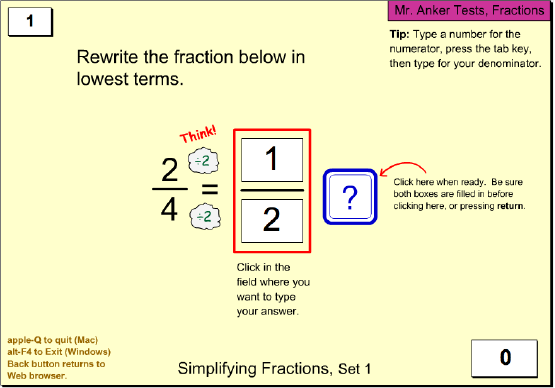 More complex fractions with clear illustrations, no simplification is used. 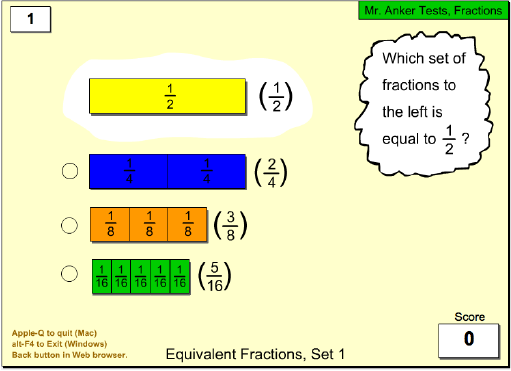 Even more complex fractions with clear illustrations, still no simplification is used. Complex fractions with clear illustrations, simplification is required. 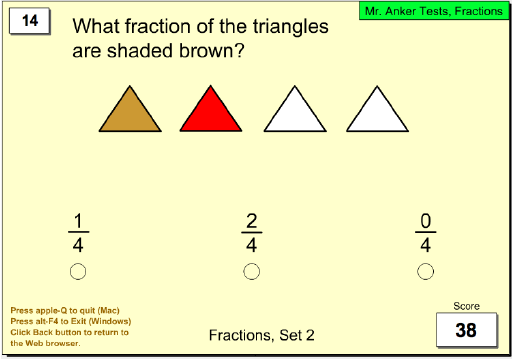 Adding fractions with clear illustrations, simplification is used on the last question only. 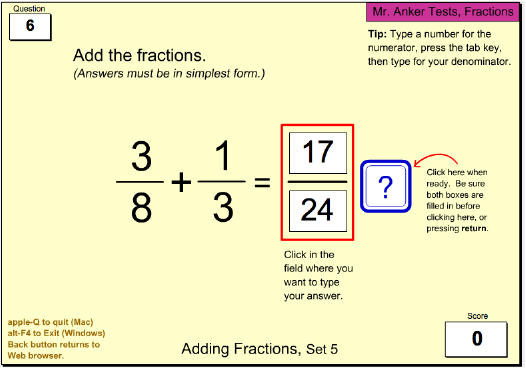 Adding fractions without illustrations, simplification is not used. 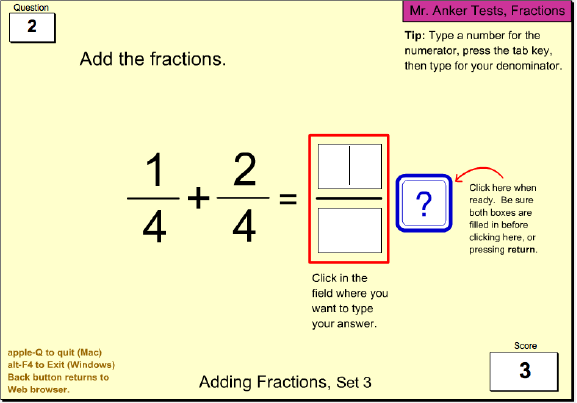 Add fractions without illustrations. Requires simplification. Includes a tutorial on finding the Least Common Denominator(LCD). Add fractions without illustrations. 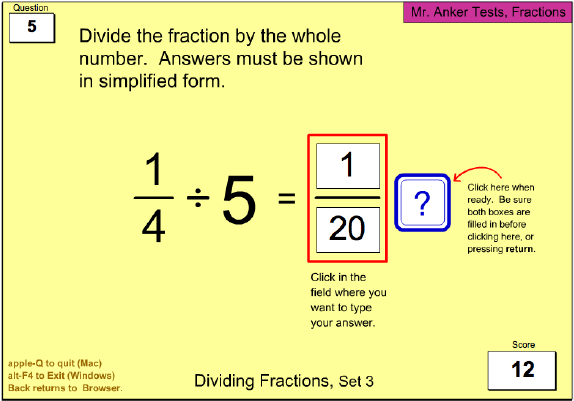 Some questions require simplification of both fraction addends and the final answer. Includes a tutorial on finding the Least Common Denominator(LCD). 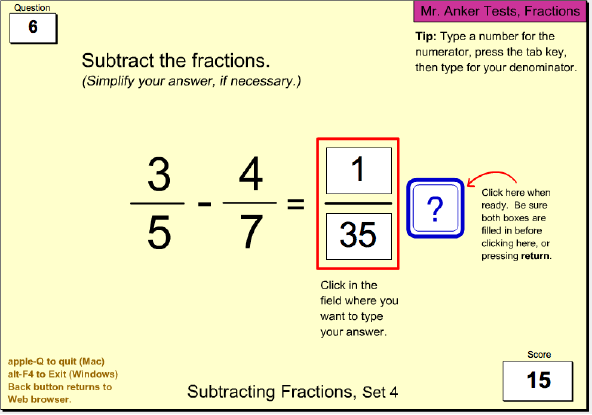 Subtract fractions without illustrations, though all with like denominators. 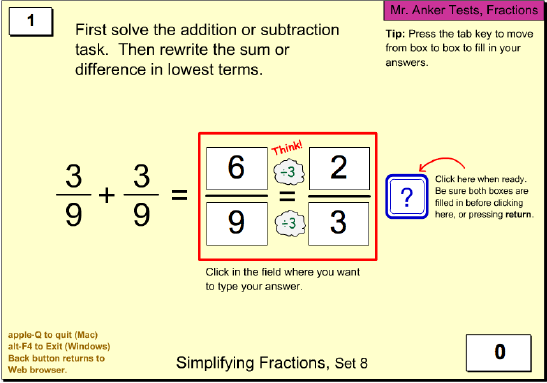 Simplification is not used. About the same level as Subtraction 1, all questions with like denominators. 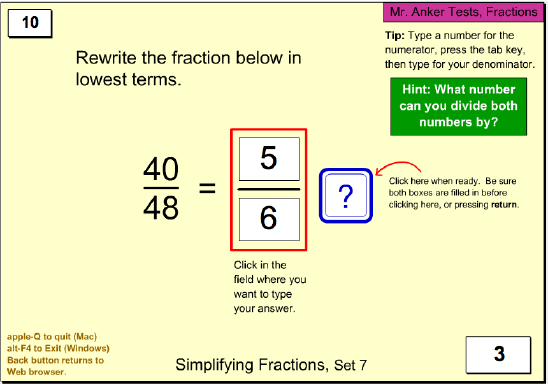 Simplification is not used. All questions with unlike denominators. 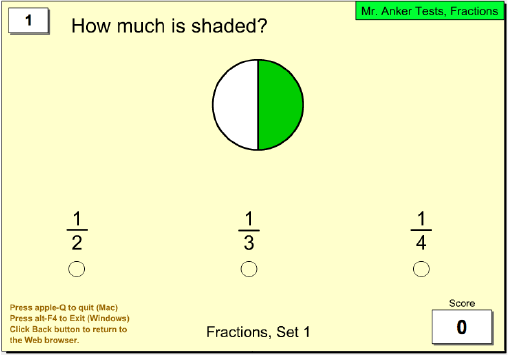 Some questions require simplification of both fraction subtrahend and minuend, as well as the final answer. All questions with unlike denominators. Some questions require simplification of either the fraction subtrahend and minuend, as well as the final answer. 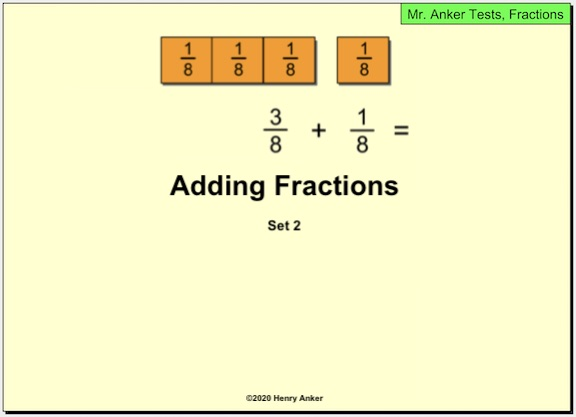 Similar to Subtracting Fractions 4. 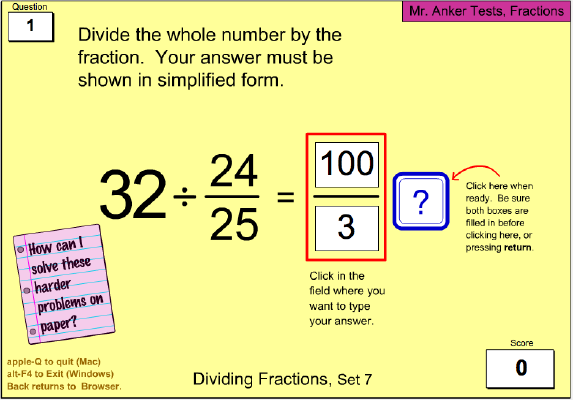 All questions require simplification of either the fraction subtrahend and minuend, as well as the final answer. 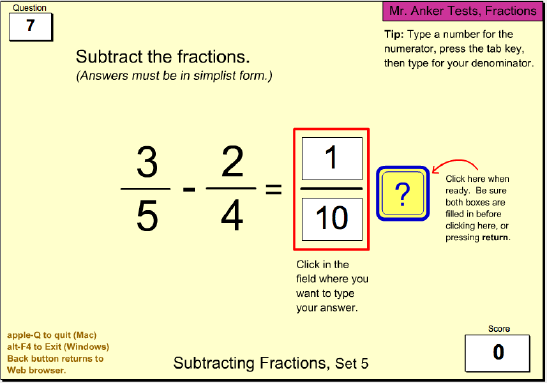 Similar to Subtracting Fractions 5. 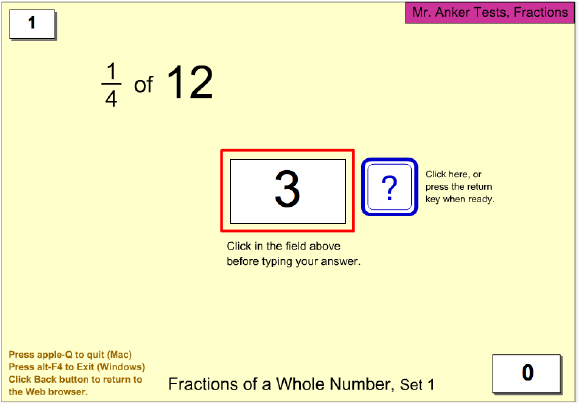 All questions require simplification of either the fraction subtrahend and minuend, as well as the final answer. Multiply simple fractions. 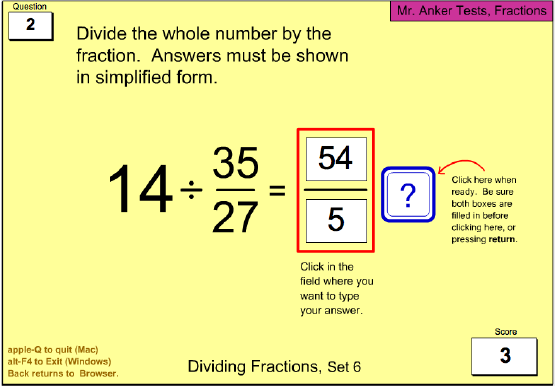 Simplification not needed for this activity, though numbers will be larger. 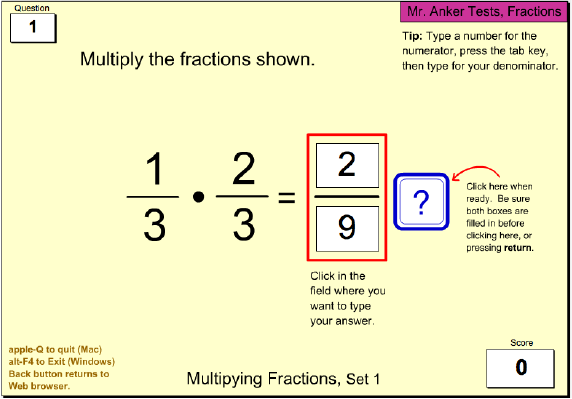 Multiply simple fractions. Answers must be simplified. Simplification model included. 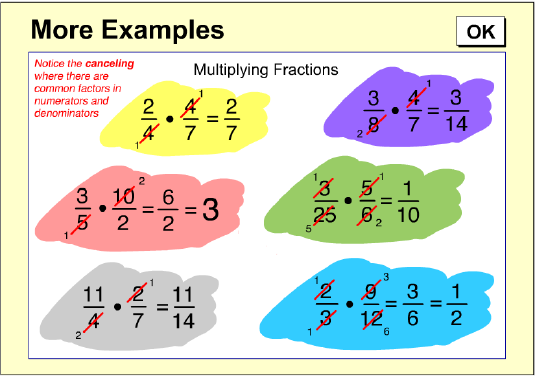 Multiply simple fractions using cancelling method and simplification. 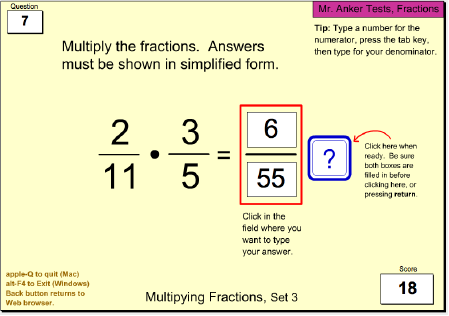 Multiply simple fractions. Cancellation & simplified needed. 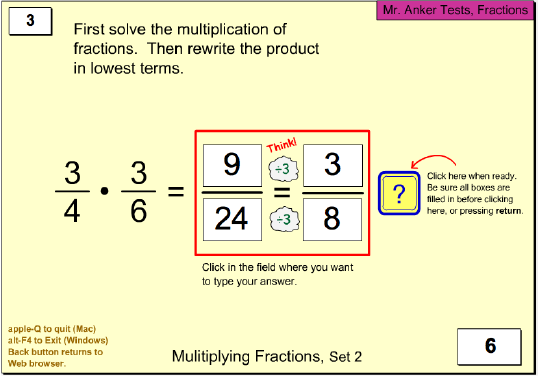 Simplification model included. 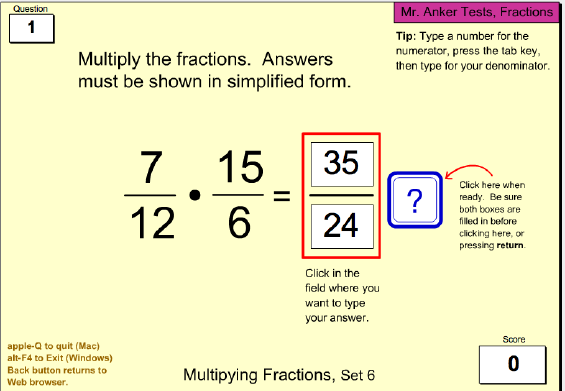 Multiply fractions with larger numbers. 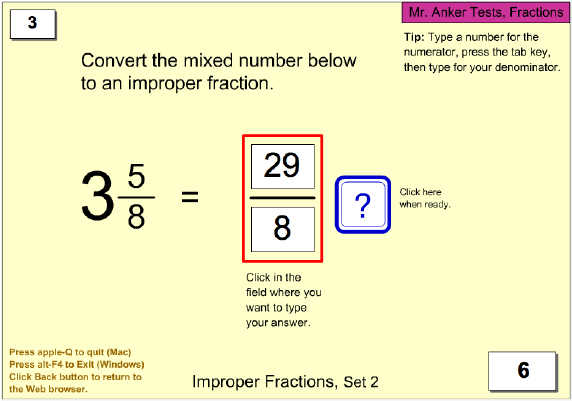 Cancellation & Simplification needed. 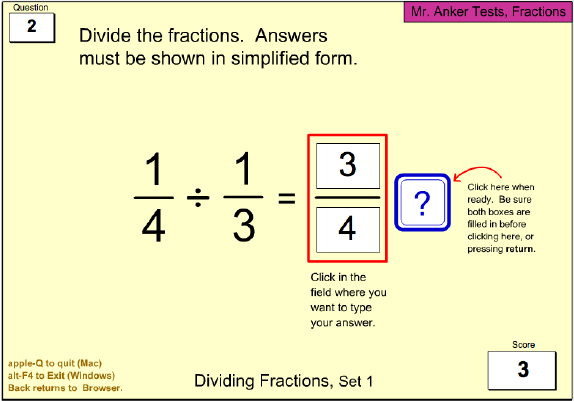 Divide simple fractions. 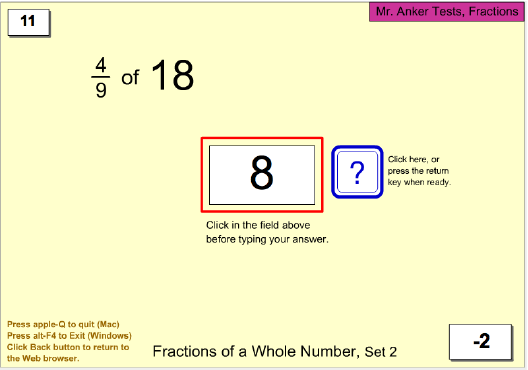 Answers must be entered in simplest form. 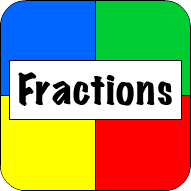 Divide a fraction by a whole number. 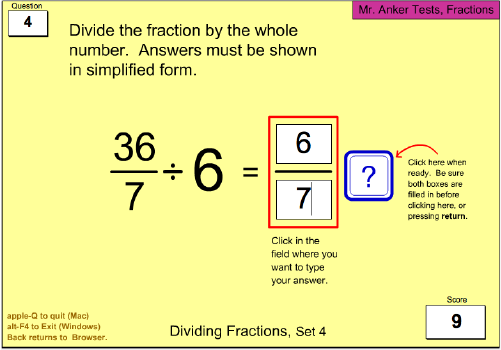 Divide a fraction by a whole number (larger values are used). 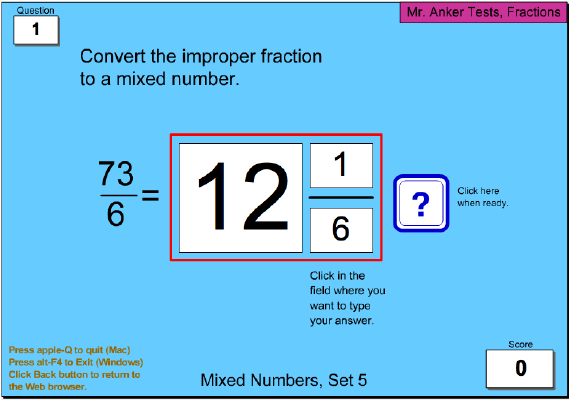 Divide a whole number by a fraction. 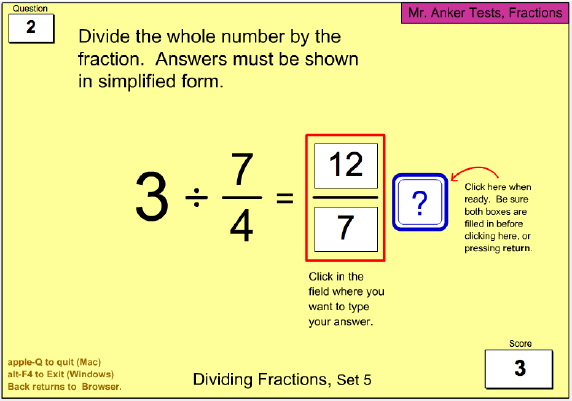 Divide a whole number by a fraction (larger values are used). 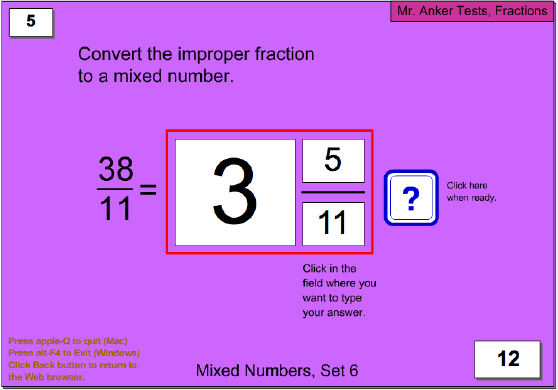 Divide with fractions and whole numbers. 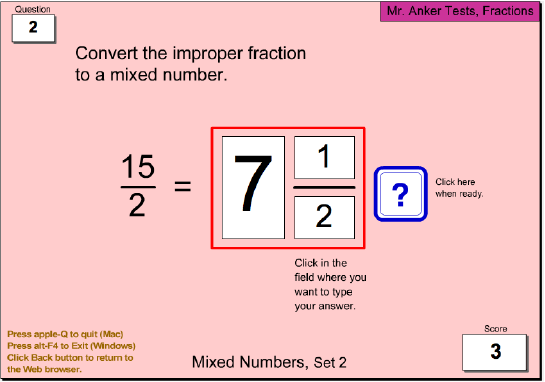 Convert a mixed number to an improper fraction. 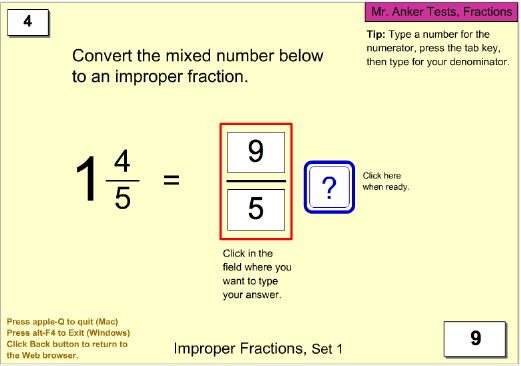 Convert a mixed number to an improper fraction (larger values are used). 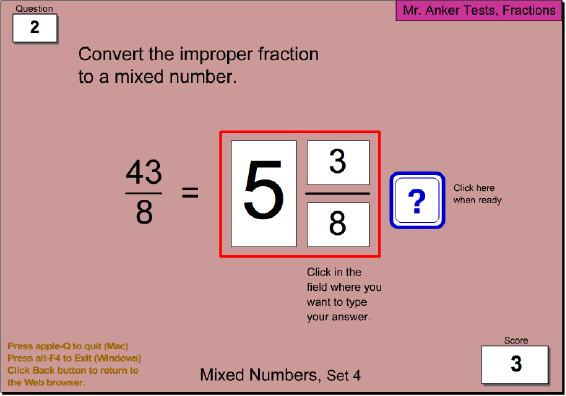 Convert an improper fraction to a mixed number. 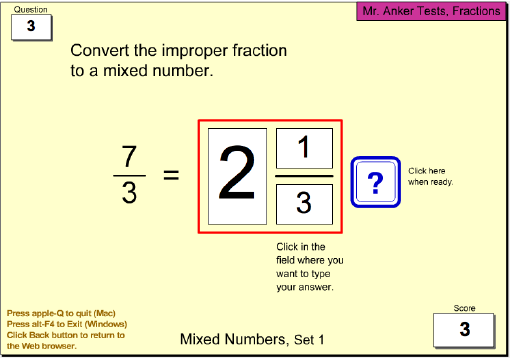 Convert an improper fraction to a mixed number (larger values are used). Simplify easy fractions. 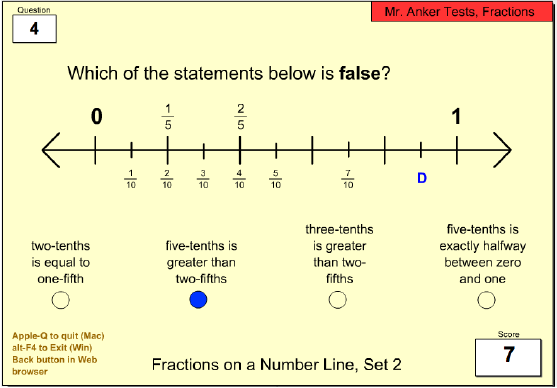 Hints are available on all exercises. 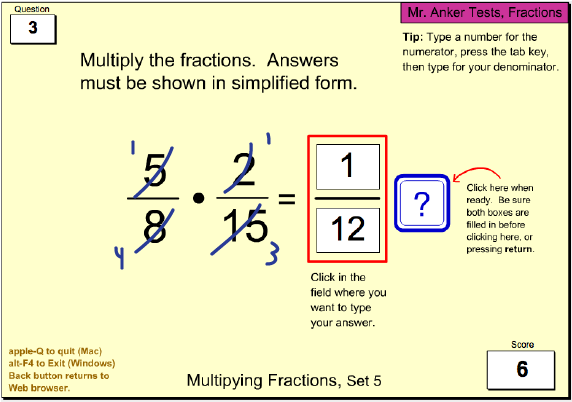 Simplify easy fractions. Hints available. 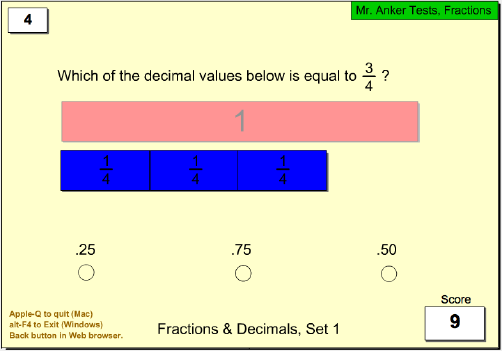 (larger numbers). Simplify easy fractions. Hints available, but are removed in last exercises. 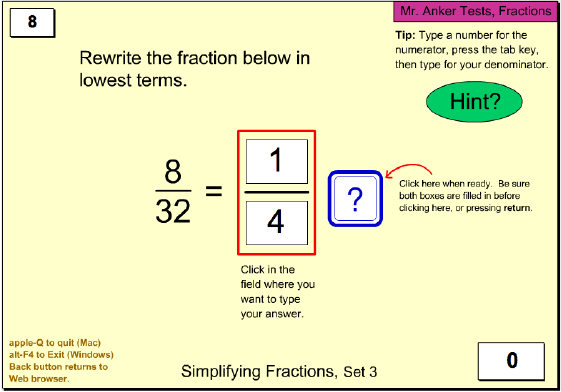 Add & subtract fractions, then simplify with hints shown. 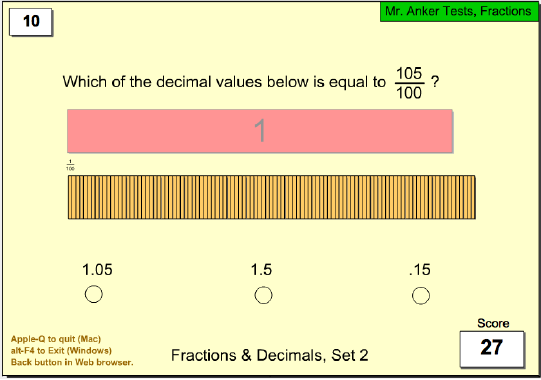 Identify the location of the fraction on the number line. 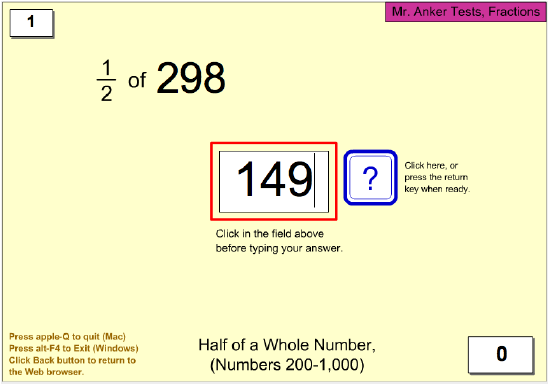 Using mental math, find half of a whole number.